An emphatic victory followed for the 27-year-old who is the first of his countrymen to win the 103rd Australian Open. Ancer, the world’s 98th-ranked player who lives and plays in the United States, set it up with a brilliant third-round 65 when the conditions were difficult, then closed the door on everyone with another fine round today. Starting out with a lead of five shots, he was never really threatened. At one point he pushed the buffer out to seven; momentarily, when he bogeyed the 12th, Dimi Papadatos pulled within four. But right at that moment Papadatas’ nerve failed him. A flared tee shot at the par-5 14th into sand, and four putts from long range on the difficult, undulating green gave him a double-bogey 7 when he could least afford it. Ancer kept himself away from the many water hazards at The Lakes, although he went close to the hazard at the par-5 14th, just clearing it with his puzzlingly aggressive second shot. A chip up close and then a nice, curling birdie putt later, and he was untouchable. He lipped out for birdies at the 16th and 17th then hit the green at the par-3 18th and two-putted for the win. His five-shot win was the largest margin of victory since Jordan Spieth won by six at The Australian in 2014. 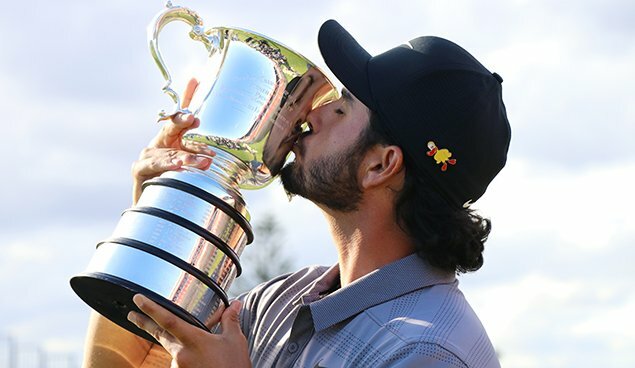 Papadatos was runner-up at 11-under, by far his best result in an Open, and Queenslander Jake McLeod, last week’s New South Wales Open winner, was third at 10-under just ahead of veteran Marcus Fraser at nine-under. For Ancer (along with Padadatos and McLeod), it gives him a start in next year’s Open Championship at Royal Portrush in Northern Ireland. It is his second tournament victory as a professional, after the Novia Scotia Open 2015, but he is nobody’s idea of a journeyman. His world ranking will climb into the 60s next week and he is in the frame for Presidents Cup selection next year. He has shot in the 60s in 11 of his past 12 rounds. The Australian Open returns to The Australian Golf Club from December 5-8 next year. Does Your Club Have A Problem With Customer Service?